To create the shaker frame, I used the negative cut of my Femme Frames Stitched Frame die. It makes a perfect frame from an A2-sized panel. I love how the acetate gives you that 3D look! Thanks for stopping in today! Come back tomorrow for another stamp highlight and don't forget to check out what the rest of the DT has done with this fun set! What a fun shaker card!! How in the world do you keep your hexagonal glitter from sticking to your acetate?? I tried dryer sheets and washing the acetate with soap/warm water and it still sticks!! So fun! Love the big old shaker, those sequins are perfect! This rocks, JJ! 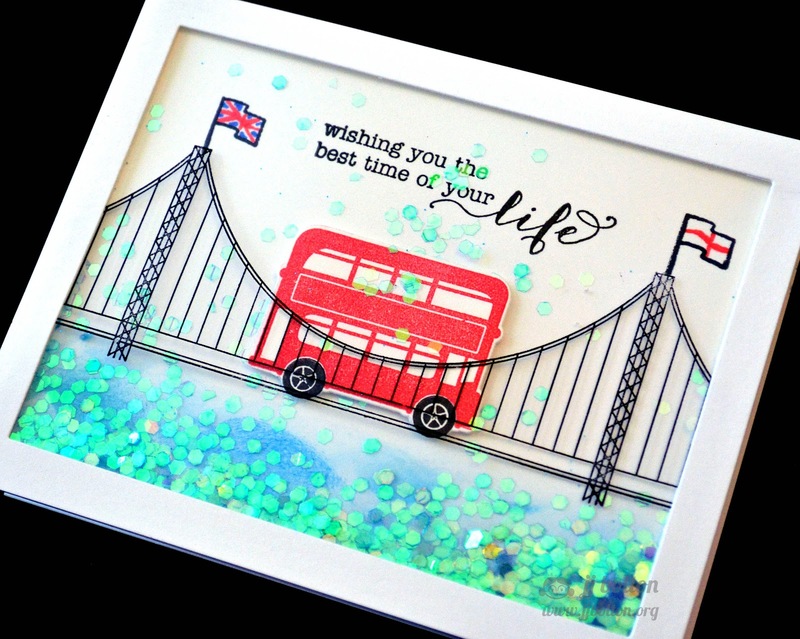 Your shaker card sequins are the perfect blue for the Tower Bridge water...when I saw the Tower Bridge in person in 2010, I couldn't believe how BLUE the Bridge color was! I absolutely love this card!! JJ this is absolutely fantastic! You do some of the coolest things! Love, love, love your shaker card! This card is SO 100% you, JJ! Happy, clever and perfectly executed. What's not to love? Brilliant idea with stunning results, JJ! 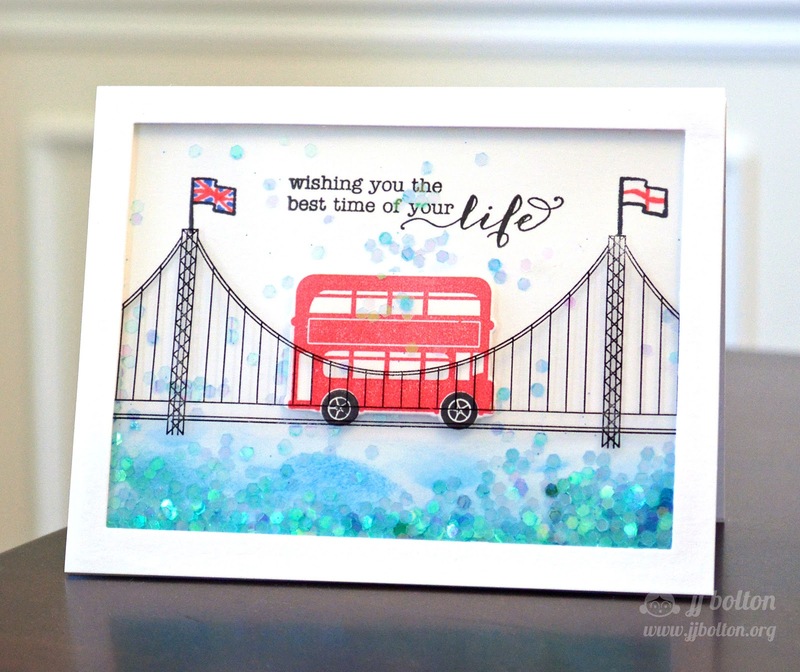 I love that you created a shaker card for these images...so fun, and the water underneath the bridge is amazing! I'll bet this card really sparkles IRL and that the 3D effect is really cool! WoW! Great card! Love how you made the water look! Super job! Hahaha ... I'm laughing because I would have never thought "shaker card" by looking at those stamps!! I'm so glad YOU did though! The bridge on the acetate is inspired. genius! I love the shapes you used inside the shaker - teeny perfection! ooohh, I love all the glitter! Great card! What kind of sequins or glitter did you use for the card?